The curved shape of this shawl is the perfect compliment to the Showy Garter Stitch. The Showy Decrease (a simple modification to a k2tog) adds raised lines that run perpendicular to the garter ridges for a dramatic look. You can see the vertical implementation of this idea in the Granite Lake Shawl. The bias shaping in the Cassini Shawl curves the continuous lines adding texture and interest to the garter stitch. There are a number of new knitting techniques included with this shawl. 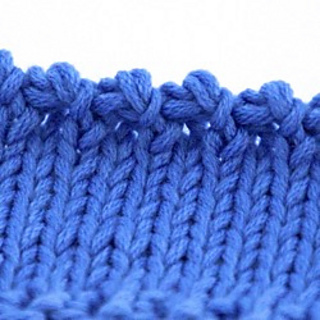 They include the Showy Decrease, Knotted K2Tog Bind Off (shown in the bottom photo) and a detailed edge stitch. If you have not seen the free Introduction to Showy Garter e-book please download that here on Ravelry to get started. It has pages of tutorials and some starter projects that will make this pattern easier to understand. There are also blog posts with more details and photos. The pattern uses five 50g balls of DK yarn or one 100g ball of gradient yarn with a smaller gauge (still knit on DK size needles). Blocking added length to all of these shawls. These are blocked dimensions. The gradient shawl is more symmetric. 6 sts per 1” in stockinette. Gauge of 5 sts per 1” in garter. Knit on US 6 or 7. Generally use a needle 1 size larger than ball gauge. The Berroco Nebula has a smaller gauge and needle size on the label. However, it was knit on US 6 and worked well as a DK gauge. The shaping means it can be knit in different gauges as well. Total yardage of approximately 700 yards for striped and 400 yards for gradient. 100g skein of gradient. 1 skein for small, 2 for larger size (you can stop whenever you reach desired size). The shawl uses 4 colors: a main color, a highly contrasting main stripe and 2 more contrasting colors for the bands. You can, of course, play with your own stripe design. The pattern starts with wide stripes and move toward narrower stripes at the end to give flexibility when managing remaining yardage in each color. Showy Garter projects are not difficult to knit. The techniques are straight forward and this shawl is 90% knit stitch. The helpful part is being able to recognize the pattern on the knit fabric so you can knit it without looking at the pattern at all. I would call it an intermediate pattern. Less experienced knitters can start with one of the simpler projects in our Introduction e-book. The pattern come with 3 You Tube videos to support the pattern. The first is an overview of the design, how it’s shaped and details on the new techniques. There is also a 20-minute how to video where you can start the shawl with me and get a close up view of the new techniques. A separate video will show you how to work the pretty Knotted K2Tog Bind Off. The blog post has links to all the other online support.